Transylvania 6-5000. Jadran Film 1985. I’ve heard mixed reviews about this movie. Everything from “it was awful” to “it’s not so good”. When Leonard Maltin famously reviews a film with “it stunk. I’m Leonard Maltin”, it gives me pause, but I’m hoping some of the other reviews that lean toward “it’s okay if you’re expecting a dumb comedy” are more accurate. Mismanaged expectations are one of the biggest killers of film reputations. Also, I tend to rate more favorably than many, or at least I think I do. I’ve recently had opportunity to compare how I rate films on a five-point scale to others, and found that on such a scale, the really good movies tend to get fours unless I was especially wowed by them, which is a higher bar for me than for others. Maybe doing this blog for three years has made me harder to please. More on-topic, I can’t imagine Jeff Goldblum turning in a bad performance. I guess I don’t really know much about Begley other than this seems to be out of the general type I put him in. Jack and Gil, a pair of tabloid reporters, are sent to Transylvania to investigate a video that claims to be a Frankenstein(‘s Monster) sighting. While Jack, who wants to be a serious journalist, is skeptical and dismissive of the whole thing, Gil is completely credulous and neurotic. Of course when the scary monsters do show up, only Gil sees them. They’re welcomed by the mayor, who insists that there are no such things in Transylvania. But not everything adds up, and it all points to de-licensed doctor Malavaqua. I’ve seen much worse. Though the production values are not always terrific (music alternates between scarce and super-cheap, and the titles and credits were thrown together in ten minutes), the writing is usually pretty funny. I laughed pretty loudly a few times. Early on there are some scenes that drag, but they’re still a little amusing in a “I can’t believe they expected me to laugh at this but I am” sort of way. The parts at the beginning that drag the most are partly because Goldblum and Begley don’t have any lines and can’t do anything to save it. I think of Goldblum as a neurotic type, but he demonstrates again here that he can be energetic without being frantic. Begley on the other hand is at the same time familiar and completely different. I would have pegged him for Goldblum’s character and vice-versa, but it works. It’s no wonder I was thinking his role was played by Jeff Daniels, though. He’s got Daniels’ neuroses and hair. Meanwhile, when the story finally gets around to introducing Malavaqua, Joseph Bologna is pretty fun to watch. He reminds me of a store-brand version of Mel Brooks. 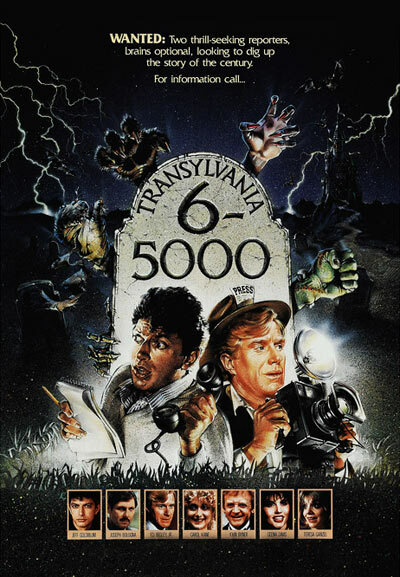 Transylvania 6-5000 was more than decent. This is Yesterday’s Movies. Watch this movie: because it’s better than anything Mystery Science Theater 3000 would riff on (though Rifftrax probably did). Don’t watch this movie: If you want a Universal Pictures Horror throwback.